Carbaglu (carglumic acid) is a man-made form of an enzyme that occurs naturally in the liver. This enzyme is necessary for processing excess nitrogen produced when the body metabolizes proteins. Without this enzyme, nitrogen builds up in the form of ammonia and is not removed from the body. Ammonia is very toxic when it circulates in blood and tissues and can cause permanent brain damage, coma, or death. Carbaglu is used to treat hyperammonemia (HYE-per-AM-moe-NEE-mee-a), a urea cycle disorder caused by lack of a certain liver enzyme. Carbaglu is usually given with other medications to treat this lifelong disorder. Avoid eating foods that are high in protein when you first start taking Carbaglu. Follow your doctor’s instructions about any other restrictions on food, beverages, or activity. Your doctor may occasionally change your dose to make sure you get the best results. Dose adjustments are especially important as your child grows. To be sure Carbaglu is helping your condition and is not causing harmful effects, your blood will need to be tested often. A buildup of ammonia in the blood can quickly cause brain injury or death. Do not miss any follow up visits to your doctor for blood tests. Every person with a urea cycle disorder should remain under the care of a doctor. If you skip a meal, do not take your dose of Carbaglu. Wait until your next meal. Carbaglu is only part of a complete program of treatment that may also include a special diet and other medications. It is very important to follow the diet plan created for you by your doctor or nutrition counselor. You should become very familiar with the list of foods you should eat or avoid to help control your condition. FDA pregnancy category C. It is not known whether Carbaglu will harm an unborn baby. Tell your doctor if you are pregnant or plan to become pregnant while using Carbaglu. It is not known whether carglumic acid passes into breast milk or if it could harm a nursing baby. You should not breast-feed while you are using Carbaglu. How should I take Carbaglu? Take Carbaglu exactly as prescribed by your doctor. Do not take in larger or smaller amounts or for longer than recommended. Follow the directions on your prescription label. Carbaglu is usually taken 2 to 4 times each day, just before each meal or feeding. Follow your doctor’s instructions. Do not chew, crush, or swallow the Carbaglu tablet whole. Place it into a glass of water and allow the tablet to disperse in the liquid. The tablet will not dissolve completely. Drink this mixture right away. To make sure you get the entire dose, add a little more liquid to the same glass, swirl gently and drink right away. The Carbaglu tablet may be taken with an oral syringe as follows: Place a 200-milligram tablet into an oral syringe and draw 2.5 milliliters of water into the syringe. Shake until the tablet is dispersed and then empty the syringe into your mouth. Refill the syringe with water, shake gently, and empty into your mouth. The Carbaglu tablet can also be given through a nasogastric (NG) feeding tube as follows: Disperse the tablet in an oral syringe as directed above. Attach the syringe to the NG tube and push the plunger down to empty the syringe into the tube. Then flush the tube with more water to wash the contents down. Store unopened bottles of Carbaglu tablets in the refrigerator, do not freeze. After opening the bottle, store at room temperature away from moisture and heat. Do not store opened bottles in the refrigerator. Keep the bottle tightly closed when not in use. What should I avoid while taking Carbaglu? Avoid eating foods that are high in protein when you first start taking Carbaglu. pain or fullness in your ear, hearing problems. 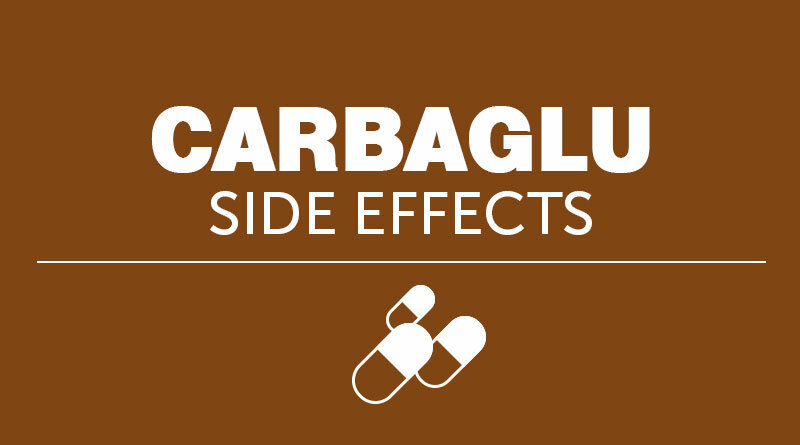 What other drugs will affect Carbaglu? There may be other drugs that can interact with Carbaglu. Tell your doctor about all the prescription and over-the-counter medications you use. This includes vitamins, minerals, herbal products, and drugs prescribed by other doctors. Do not start using a new medication without telling your doctor.